Hi Tampa Bay, Alex here to let you know that the Amtrak&apos;s 40th Anniversary Exhibit Train is coming to the Tampa Union Station. The free Amtrak Exhibit Train is coming to Tampa Union Station on Saturday and Sunday, February 18 & 19 from 10a.m. - 4p.m. 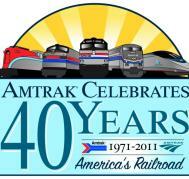 Amtrak is 40 and to commemorate the occasion, the Exhibit Train is touring the country and making a stop in Tampa Bay! The Exhibit Train event will also include a train-themed kids’ activity area, Chuggington Depot, which is based on the popular television series on Disney Junior. This will be a fun exhibit for adults and children! Check back with us often for more information on Things To Do In Tampa Bay!